9" x 12" Original drawing on tan paper. Colored pencil, pearlescent & glitter paint, gel pens. 5 x 7 inches. Original coming soon. Licensed animation coming soon. Original was colored pencil. Digital additions were made. This is shown with the digital changes for which I have prints for sale. The prints come with a black skull on her forehead. Please specify if you prefer the white skull instead or if you want multiples, how many of each skull color. I can invoice you with any price adjustments if necessary. As always, watermark will not appear on your prints. © Joyce Jackson. All rights reserved. This is a page of my latest work. A main ingredient of the highly alcoholic beverage Absinthe is Wormwood. Healing aspect: The Wormwood herb has historically been used in the treatment of parasites & other illnesses. The parasite-like swirls emanating from the bottle are being destroyed by the fairy host. This is a metaphor for ridding oneself of harmful emotional or mental habits and addictions, & physical internal cleansing. Destroyer aspect: In the past, the drink Absinthe was seen as poisonous & capable of causing mental illness. This may have been due to the way it was made. Wormwood was referred to in Revelations, the last book in the Bible, as a great star, blazing like a torch that fell from the sky. It destroyed a third of the waters and turned them bitter, killing many people. 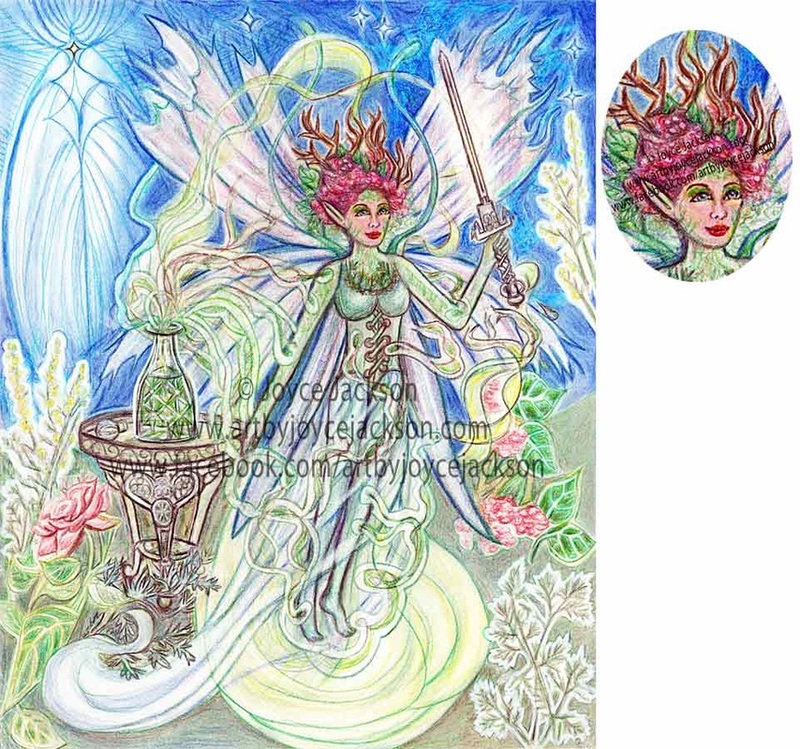 A sword held by the fairy represents Absinthe’s dual nature, the proverbial double-edged sword that can harm or help depending on which stroke of the blade is delivered or received. The fairy represents references that have been made to Absinthe as the Green Fairy, aka <<La Fée Verte>> in French. The background story on creating this: At first I resisted the negative side re: Absinthe that I saw in my research. When I relaxed into it & stopped resisting, more details came to me as I lived my life. I think it expresses my progress at seeing how life's patterns of good & bad are intertwined & accepting both with equanimity. I love it when my artwork is a healing dream & that I can share that. Now includes an ornate black frame in which it's mounted and ready to hang. "Home of the Crimson Queen"
This listing is for Limited Edition prints. Limited to 10 prints in these 2 sizes. For this Limited Edition, glitter embellishments will be added. 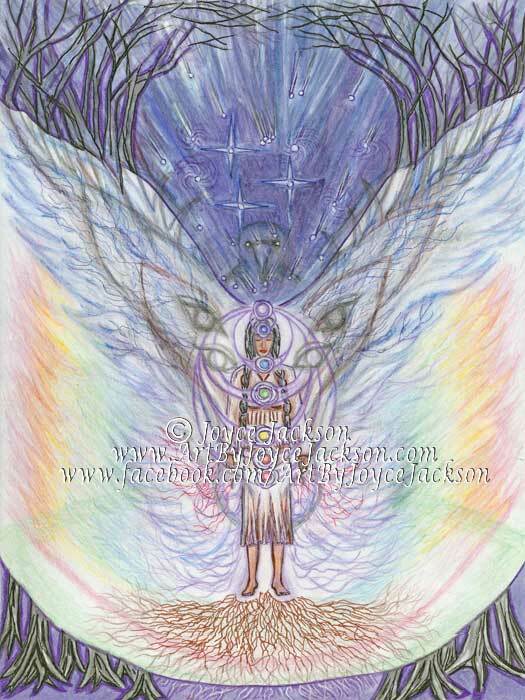 Shown is ACEO size, 2.5" x 3.5". Same proportions as 5" x 7". Original artwork. A story emerged as I created the artwork. A special kind of dragon species whose Queen eats red roses. The Queen's newly hatched consort, a human/dragonfly hybrid, feeds her the special food that gives her a crimson hue. 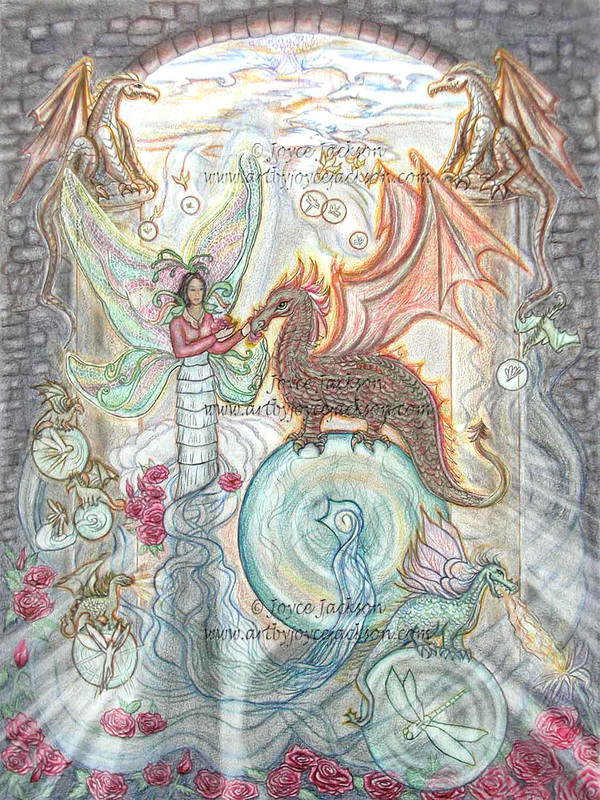 Choose Limited Edition prints in 2 sizes, made from the original, ACEO-sized colored pencil drawing. Original is sold. I started this as a pencil sketch and revamped it digitally. 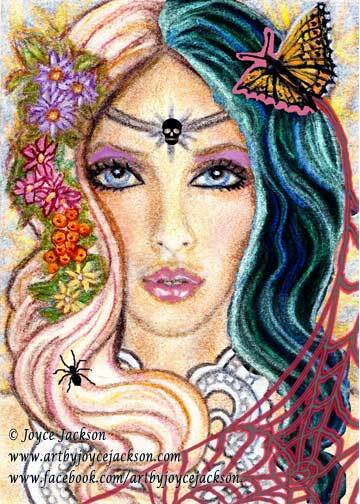 I created it as an ACEO card on multi-media paper. An ACEO card is an Art Card, Edition, or Original that is 2.5" x 3.5". This is a crossover between Original and Edition. I'm offering these as Signed, Numbered, Limited Editions with my signature and edition info on the back. Edition will be Limited to only 10 like this; more of a collectible that way. I made it to fit the September, 2014 theme at a Facebook fantasy art auction. 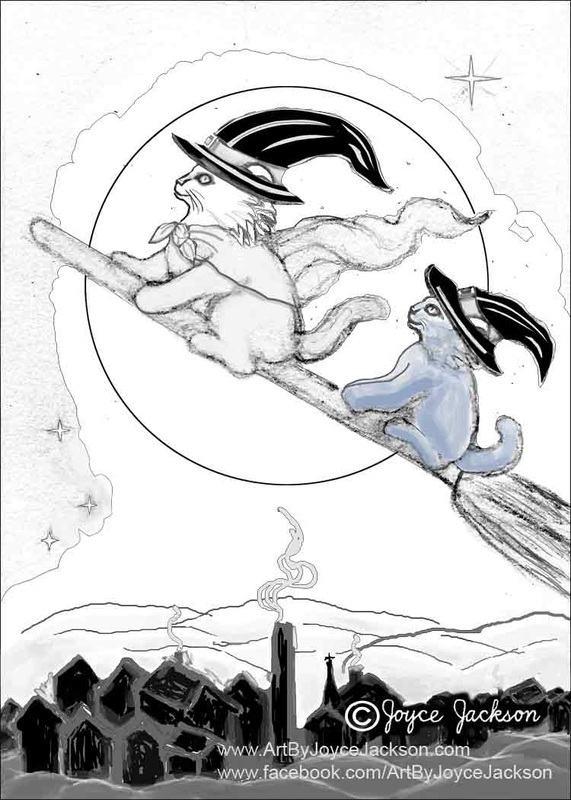 It was the 2nd runner-up theme chosen by popular vote, Witchling. 12" x 16". Watercolor & colored pencils. Ready to hang. This was mounted on a black gallery wrapped canvas and framed in a metallic gold frame on Sept. 10, 2015. I also added some fall leaf colors to the background as I was readying it for the Schenectady Stockade art show. Done for the October, 2014 Enchanted Visions theme, The Brew. 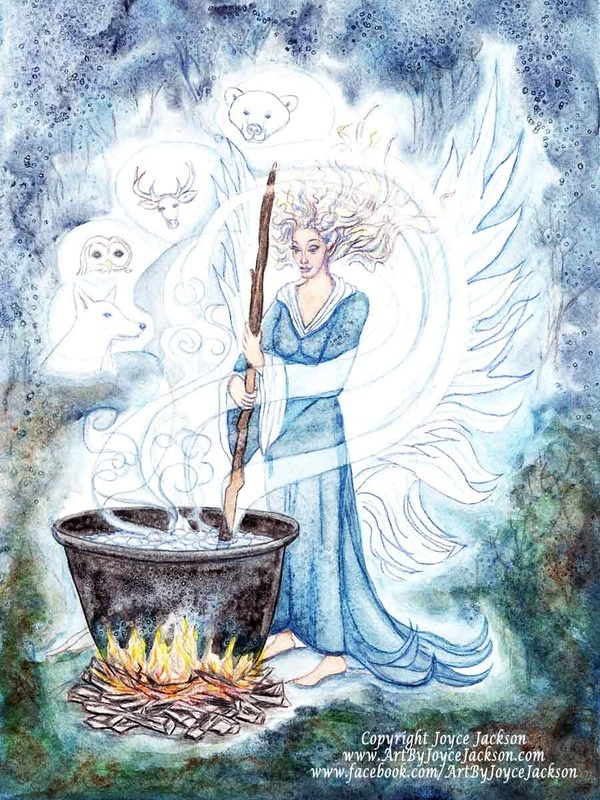 A witch fairy stirs her cauldron of magical substances. She summons her familiars, the animals coming to accompany her on the left. 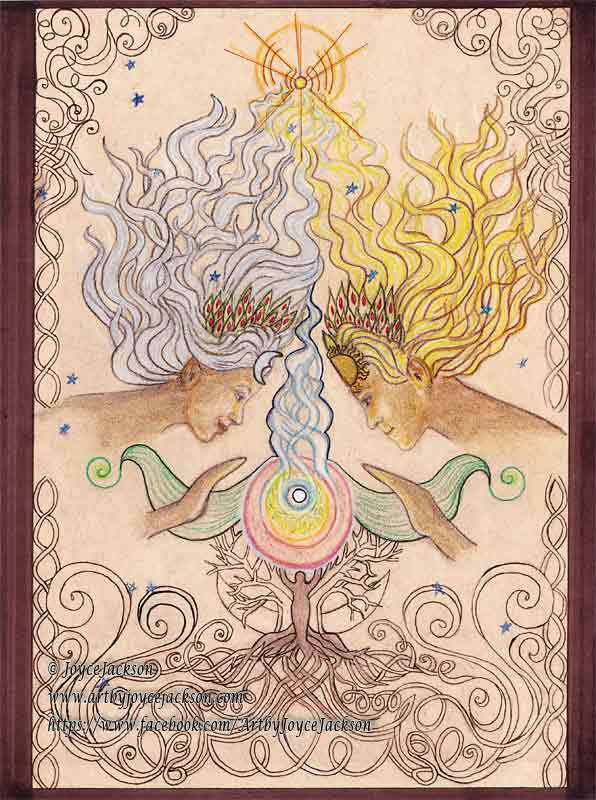 People of former ages may have felt a desire arise to commune with their higher natures in similar ways. Eventually, names were given to these practices. Witchcraft, Wiccan, Pagan, etc. I think they were originally just the innocent and spontaneous outcome of a desire to attune to the forces of nature in meaningful ways. Rituals and religious or spiritual groups and organizations were formed around them. They provided structured environments as people sought ways to auspiciously invite the recurrence of the magical. In its age of innocence, it was simply meant to soothe the ages-old yearning of the soul for life to be more meaningful. Fearfulness and ignorance are the root cause of evil, ugly perversions that became associated with and expressed through pagan-style practices down through the ages. Signed Numbered Edition, Limited to 10 prints. These will have special additions such as glitter embellishments to ensure their status as genuine Limited Edition prints. As always, watermark will not appear on your purchase. 11" x 15" watercolor on paper. which is fitted to mahogany frame. In real life, I've always had a fascination for crystals. I've done crystal mining for double pointed Herkimer quartz crystals local to me. I have a collection at home. 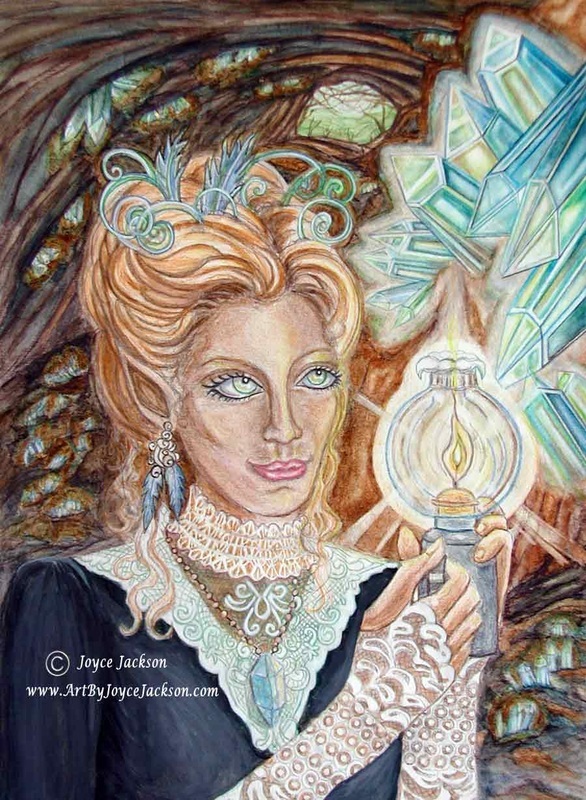 I enjoy having been born in the small city of Herkimer, NY for which the crystals were named. This is now available in a newer version with a few small changes. Also includes finished black frame in which it's mounted and is ready for hanging. 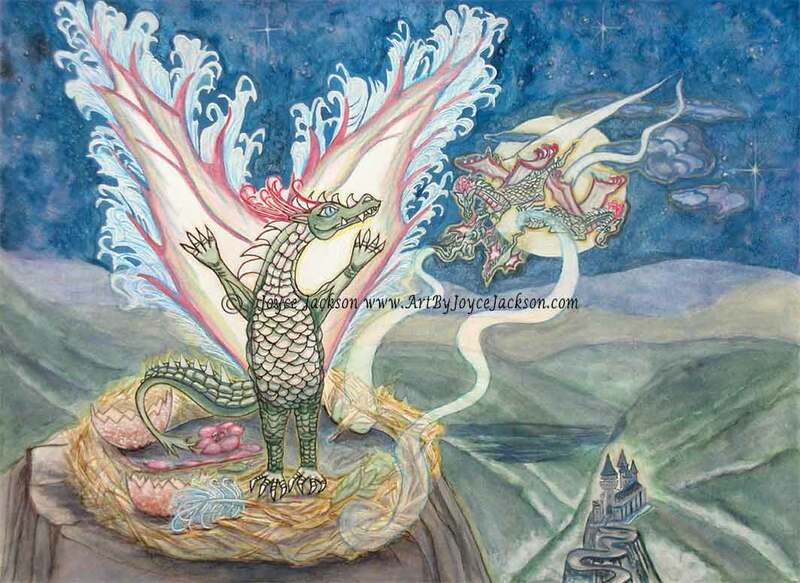 The young baby dragon who has to watch while its siblings fly. It's still too small to do it, but awaits the day with eager anticipation. Created to fit the May, 2014 theme for my Enchanted Visions project group, Frustration. 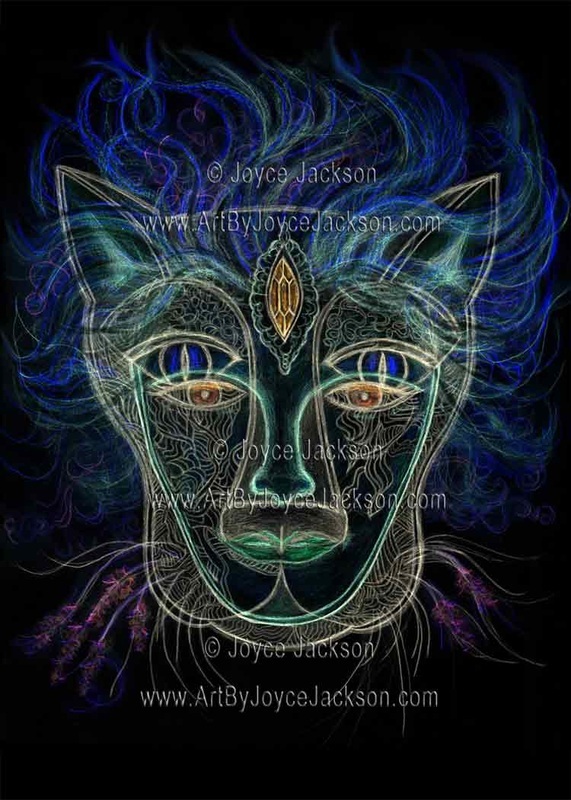 Enchanted Visions consists of international fantasy and visionary artists who are juried into the group. We create artwork based on a theme chosen for the month. 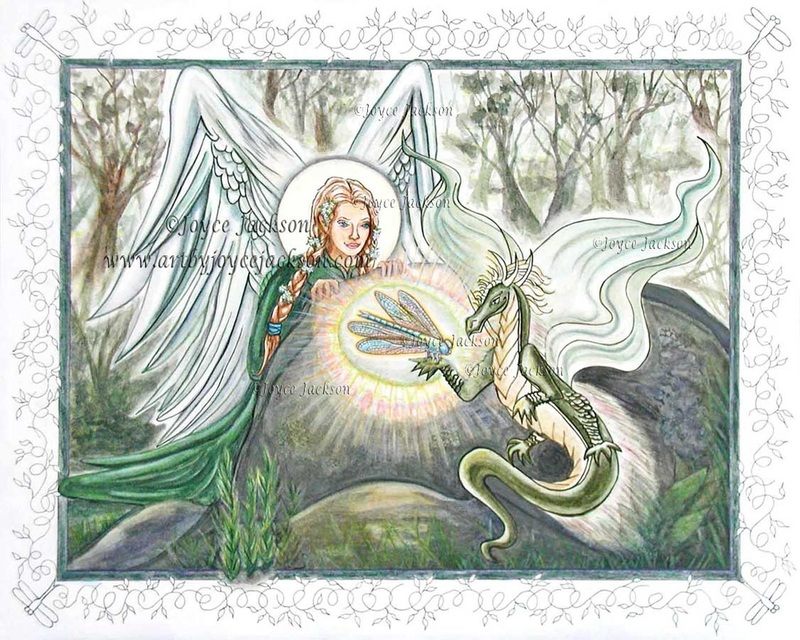 The artwork is published on the website http://www.enchanted-visions.net/. My painting illustrates the frustrated feeling of being the youngest in the family. But it also can connote eager anticipating before embarking upon a new adventure. Graduating from school, starting a new life, relationship, or whatever fits the personality and circumstances. Watermark will not appear on your purchase..
Wonder to Behold, 16" x 20"
Price includes shipping. Now also includes finished black frame in which it's mounted and is ready for hanging. Created to fit the July, 2014 theme "Wonder" for my Enchanted Visions project group. Mother Ocean's Blessing. 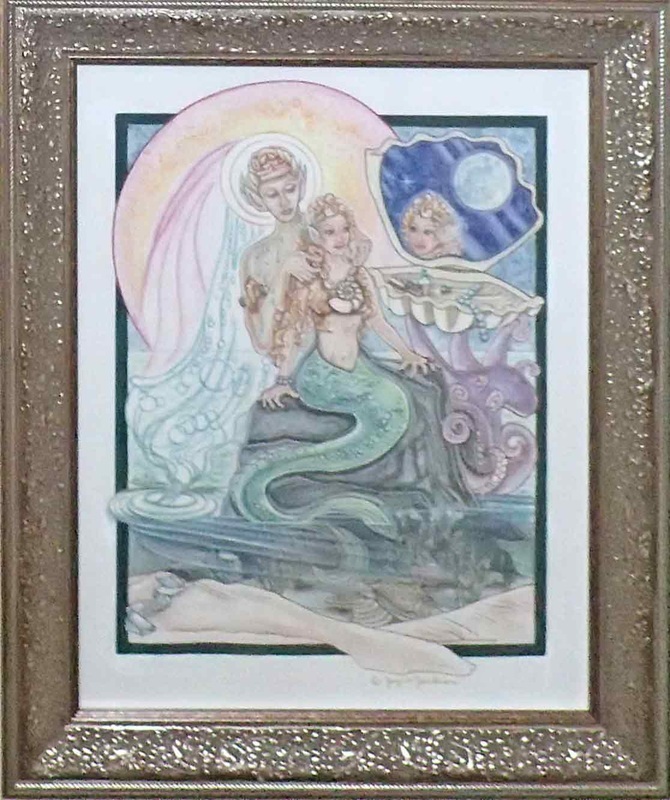 An original watercolor painting by Joyce Jackson with a white outer border which extends its dimensions to 11" x 14". Inner, dark green border is 9" x 12". 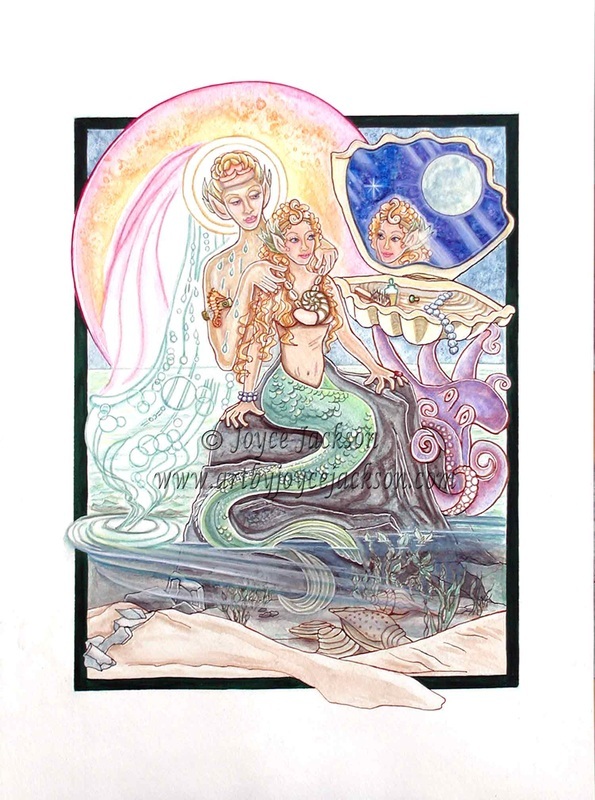 A young mermaid is initiated as a blessing giver by Mother Ocean. Created for the monthly theme at Facebook's Monthly Fantasy Art Auction, Ocean's Daughter. Each month, a theme is chosen based on the largest number of votes. Artists create artwork based on the winning theme. They offer it for sale at the auction. Watermark text will not appear on your purchase. Now includes ready-to-hang frame. Dimensions will be larger than unframed dimensions. Same as below, except includes frame. Santa's Helper. Original ACEO is sold. Signed, Numbered, Limited Edition Prints available. 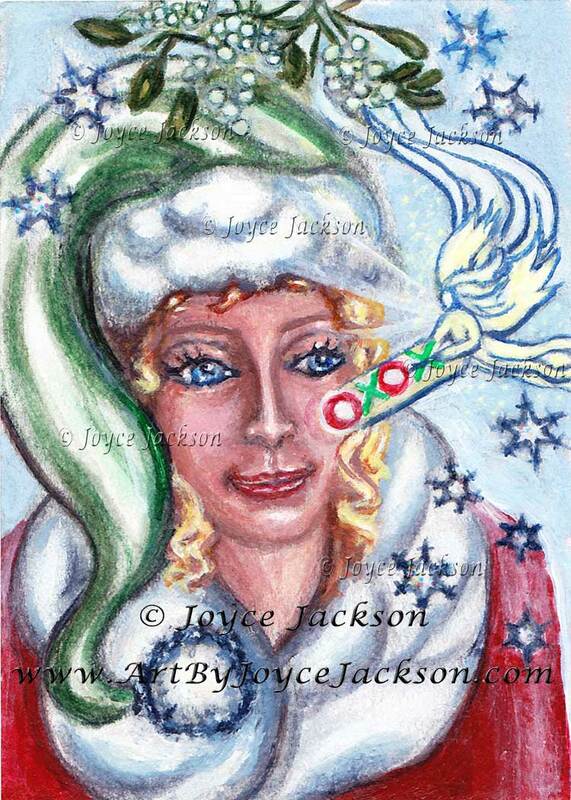 Christmas Kisses Original ACEO and Signed, Numbered, Limited Edition Prints available. Choose Limited Edition prints in 2 sizes or the original ACEO-size acrylic painting.